I’ve installed HP printers on a laptop prior… though by “install”, I mean that I plugged a printer in and it just worked. Ubuntu uses the open source HPLIP drivers. This wasn’t the case for my home computer. I was recently gifted a HP LaserJet P1005 and although it popped up in the printer list, I was unable to print to it. Ubuntu told me the print jobs were sent, but nothing comes out. Some online searching revealed the solution(s). First, I found this article, which has a commandline sample that ensures my hp-setup command would work. Apparently, this is related to a broken printer driver, which can be fixed with the following command. This install didn’t initially work for me, as I was receiving the following error. … hplip-3.15.2-plugin.run file does not match its checksum. File may have been corrupted or altered. To fix this, I followed these instructions and went to the HPLIP website and grabbed the two corresponding files (.run and .asc). Now, when running the hp-setup wizard, it asks if I want to download drivers or use local files. Go with the local option and browse to the path of the files you just downloaded. That was it. Internet saves the day yet again. These images might help you if you’re trying to get recording to work. The answers are out there, but this puts them together in a nice visual package. Turn up the Mic AND Analog Mix! Configuring my mouse on Linux hasn’t been too important as I tend to be using my mouse on a desktop computer. More desk space means more elbowroom to move around, so I don’t do anything fancy with the mouse “acceleration”. However, working on a laptop changes this because I’m typically working with limited space. To maximize efficiency, slow movements should be more accurate, easing (for example) the selection of text. Quick movements can jump the cursor to the other side of the screen without having to pull the mouse off the mousepad. Another thing I had to accommodate for (while using a laptop) is that I usually have different devices plugged in, at different times. This means that the device ID changes, depending what is plugged in. This makes it a pain in the arse to automate. This line lists the devices and then greps the lines to find the ID of the Razer Mouse. These lines then use the newly created $razer_mouse_id variable and sets up my deceleration settings. “Constant Deceleration” sets the overall speed (fastest speed), while “Velocity Scaling” sets the polling speed, how often we check (poll) the position of the mouse. The “Adaptive Deceleration” then determines just how much we effect the sensitivity of the mouse down when it’s moving… slowly (if I’m understanding this correctly). In any case, these are the settings that are working for me… for now. Setting up a new Linux build w/ Ubuntu 14.04. Have you tried it yet? Imagine booting from a USB stick and being able to test drive Linux. Without even having to install Ubuntu Linux, I was able to connect to my local library’s WiFi, read my Gmail and use my Wacom tablet. I then double-clicked the “Install Ubuntu” icon that was sitting on my desktop and let the installer run in the background… as I continued to browse the internet. If you haven’t yet, I recommend trying it. I’m not a big fan of the Unity user interface, which is the default UI for recent versions of Ubuntu. However, installing Gnome Classic was stupid easy *clicks button*. This style of UI is more comfortable for most users. 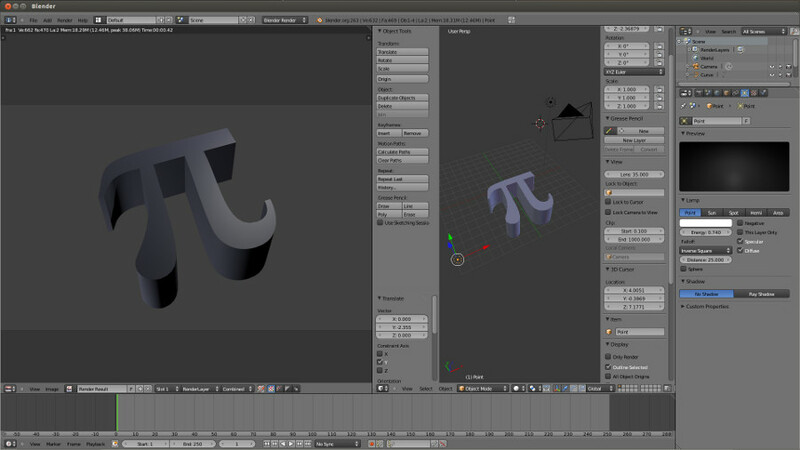 Next, I’m testing out the graphics card using the Sintel character rig in Blender. All looks good, and we’re mobile! Oh yeah… isn’t this supposed to be about Blender? Setting up an old machine that I recently pulled out of storage (2 years in Vancouver!? Poor little box). Step one is to update the Ubuntu theme to Elegant… or should I stick with Equinox w/ squared Dawn borders? Well, that’s your choice. Here’s some very simple instructions for both of them. I’d recommend Equinox first, as Elegant has a one-button solution which can activate or restore previous settings. Just tested it and it works just fine. 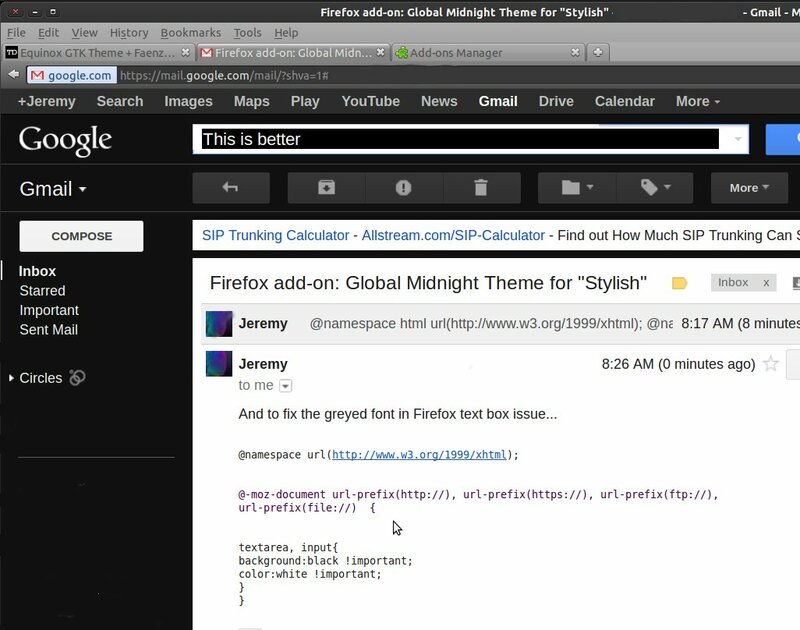 *note: I personally experienced some issues in Firefox, when using the dark themes (it was too bright!! ), so I corrected this (for the most part), by installing the Stylish add-on and then customizing my own “Global Midnight Theme”. Mwuahahahaaa! Oh yeah, and you might need to create a “Stylish” theme to correct the color of the now greyed font in input text boxes in Firefox. The left is the unstabilized video. Right right was stabilized using the vid.stab plug-ins in transcode. I use a few different processes for getting ride of the camera jitter from when hand-held shots, but I needed quicker methods for when I have a ton of videos to process. I found that vid.stab has some plug-ins for transcode that are working great for me. I followed the instructions here and then used the commands below to encode my videos. Other than some of the quick jumps in the stabilized videos, the results are great (and fast). I’m noticing the jumps occur when objects in the background are being revealed, so I’ll have to fiddle with this in the future to see how I can clean these up. You can customize your prompt in order to make it more effective. My default prompt was about half a line long and didn’t really contain much useful information to me, so I changed it, including added a little color. Me? I like to see the time and my current directory, so that’s what I added using the instructions here, and even fancier color management instructions here. Simply put, I edited my .bashrc file’s prompt entry to the following. If you haven’t done this kind of edit before, first make a backup copy file. Ok, the above line looks pretty, but the text wrapping gets funked up. You have to put escaped opening and closing square brackets around the color code chunks. The following revised line works great. And here’s the before and after. Running Ubuntu Linux and am starting an application process from my terminal window. The problem is, that window is then basically locked, not allowing me to execute more commands while the spawned application is running. To fix this, I found this command, where I basically add a & to the end of the line. This allows me to execute the command and gives me back access to the command prompt to execute more commands. So the next issue I have is, if I close that terminal window, all processes that were spawned from that window are instantly killed. No warnings, pleases or thank-yous. That’s scary for those of us that don’t save often. Ah, but there are more solutions. After executing the command, as shown above, simple execute the following command, and it will separate spawned processes from that terminal window. Or, simpler yet, why not just kick the application off from in an independent process, right from the beginning, with this util-linux command. I was wondering where the pretty little icons were for my menus while using Inkscape. This shell command (from UbuntuForums.org) brought them back. The options let you decide which license server to install, as well as whether or not to create the start menus for you. Once Houdini is running have to remember to disable the Alt hotkey in the Window Manager control panel, otherwise your Alt+clicks will not work. This can also be completed with the Compiz Settings Manager in 12.10, but it needs to be installed first. Here’s the stripped down simple instructions for installing Shake 4.1 on Linux, specifically, tried this on Ubuntu 10.10. More details can be found here. Besides the libX11.so.6.2.0 => libX11.so.6, you will also need libXi.so.6 => libXi.so.6.0.0. You can get this from the libxi6_1.2.1-2ubuntu1_i386.deb package. Details here. After a reboot and test of the new key, I remapped my mouse buttons with some help here. I first use “xinput list” to get the name of the device. I next use “xev” to find out what my mouses Middle and Thumb button positions were (2 & 9). In the command below, positions 2 & 9 have a value of 2, which is equal to my middle mouse button. Yup, I want two middle mouse buttons, so I can alternate when I feel like it. To save my wrists from tension, I’m lowering the mouse speed. Found this link which contains info on how to install Microsoft SideWinder digital joysticks and gamepads (along with many others. Next step… getting Skype to work properly. I can use my microphone, but noticed that Skype isn’t receiving any input. I’m hearing that I should first install Pulse Audio. Hmmm… so now I can still record (luckily) but not in Skype. Gah! K, now for Skype’s Linux sound FAQ. More specifically, I”m going to try this thread that talks about Skype V2 and PulseAudio support (the solution seems to be downgrading..
Lastly (I hope) I needed to get my new Wacom Intuos4 tablet working. The Wacom drivers built in to the 9.04 build work with all devices, prior to the Intuos4. Luckily, I didn’t have to run through the full install of the latest drivers supplied at the Linux Wacom Project. I only needed to compile some of the files and replace existing ones. This info was very helpful in getting everything working. Specifically I used the “animone” post to get the Wacom pen working. However, I have not yet setup the pad. Running a dual monitor setup, I wanted to restrict the tablet stylus to the left screen. According to this thread (thx Ben Simmons), I had to do a matrix transform. Luckily, I didn’t have to do any math to get it to restrict it to the primary monitor. You can even get a little creative by having the eraser control one monitor and the stylus controls the other. Just use “Wacom Intuos4 6×9 eraser” instead. Synergy – Control the Desktop of Two Computers. To install it I just ran apt-get synergy to install it. I then used these instructions to setup and run the server. Hmm, judging by this demo, it doesn’t look like it’s really “speech recognition”, but “voice commands”… ? Will have to look into further. Trying to get Plastic Animation Paper working on linux is going to be a bit tricky. I can see that already. There are minor issues with the Wacom tablet, but much larger issues with the sound drivers. Also, noted that with 9.04, PAP couldn’t find the libstdc++5 libraries, but I got the package here and all is good. So, with the sound stuff, it appears that I’m not the only one having issues. I think I’ll just stick with Pencil for now at is suits my animation needs… on Linux. Just came across this MyPaint app too. Used this link in order to download the necessary ndiswrapper packages from another computer that had internet. DLink had the drivers on their website, including 64 bit versions. Then made sure to blacklist the built-in drivers that might conflict, using this link, and this one. Not sure if I needed this, but I put the below lines in, based on this thread. next you can use readom to make an iso image of the drive. When right-clicking a folder on the server machine and trying to share it, it will automatically ask you if you want to install the services for sharing. Do it! Next, you will need to install smbfs on the client in order to mount to this new share. Finally, we will need to create a folder then mount to this newly created folder. So that both machines have the same relative references, I can make a symbolic link. For example, on the server machine I would type the following command. This thread seems to be a good location for tips on mounting shares and securities. Compiz is installed by default in 10.10, but you have to activate the extra plugins in order to get the sphere of awesomeness. For Ubuntu 12.10 (specifically to disable the Alt-Click window movements) I installed the compiz settings manager.